Maybe they shouldn’t be in the country, said the President of the United States. Yep. That’s the stuff. 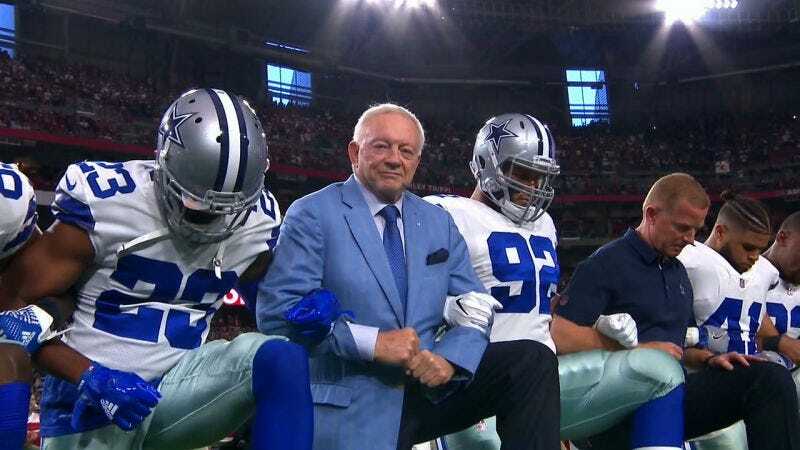 Since yesterday’s vote that maybe was never really a vote, several NFL owners/executives have admitted they were influenced into whipping up an anthem policy due to a fear of Donald Trump—the man who had weaponized the protests in the first place. But, like, why? By the end of last season, fewer than 10 players were still protesting—largely because the players got their message across, but also because the impact of a protest during the anthem had become muddled. The owners were certainly worried about their bottom lines, but in all likelihood, the protests were going to peter out in 2018—like the controversy already mostly has—without the league having to do a damn thing. And it’s not like we haven’t been here before. From Bountygate to Ray Rice to Deflategate to Ezekiel Elliott to the catch rule, the NFL’s hubris remains undefeated. The league didn’t even attempt to impose a definitive policy. Instead, it tried to saw the baby in half by allowing any would-be protesters to remain in the locker room, by carefully aiming any discipline at teams, and by sloughing the responsibility for any individualized punishment onto those teams. One problem: The league never ran any of this past the players, and now everyone’s pissed off. Schefter’s right! Get used to this kind of talk, you guys. There’s a midterm election coming up, and it’s still nearly six months away. Leave it to the NFL to create a new controversy in a clumsy attempt to “fix” a problem that was best left alone.